Your favorite take-out made at home? Yes! 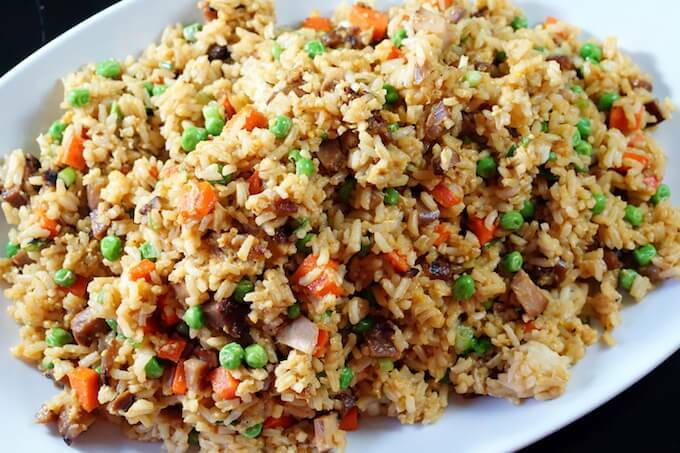 Easy Chicken Fried Rice Recipe that is simple to make and SO tasty! 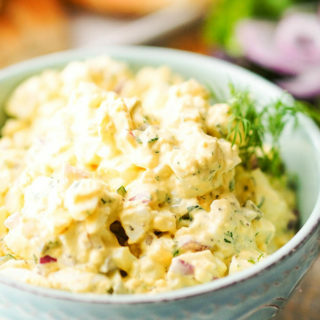 Super easy, quick and delicious you’ll be making this again and again! 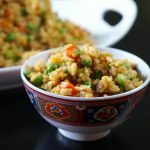 Chicken Fried Rice is easy to make at home! Last week I took a short poll to see which recipe you’d prefer to see me cook on-air, my Easy Risotto Recipe or Chicken Fried Rice. Risotto won by just two votes! 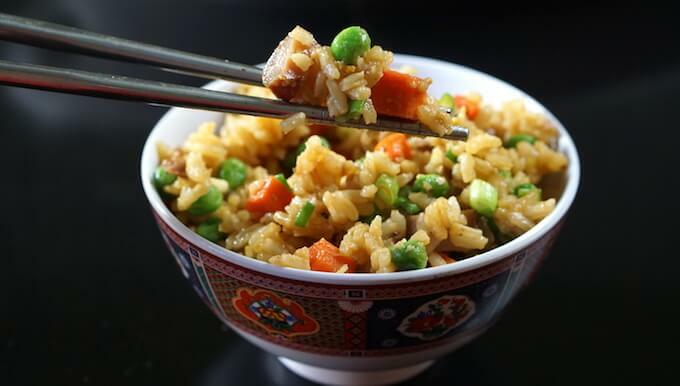 So because Fried Rice was so popular that is definitely a recipe I’d like to share also. Making Fried Rice at home is easy and you know what? It tastes a hundred times better than take out! 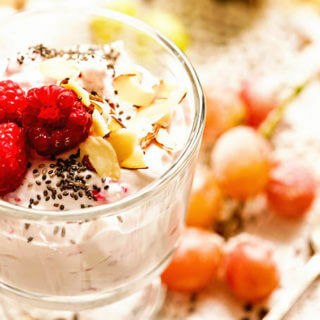 Less expensive too so why not make this yummy meal at home instead? The first thing you’ll want to do is gather your ingredients and get everything prepped and ready to go. You’ll want to get the pan screaming hot before you start and because it cooks so quickly, this meal won’t take any time at all! Add the carrots and stir fry, next you’ll add in the garlic, ginger and rice – all the while stirring because your pan will be screaming hot! Add the beaten egg first and then add soy sauce. 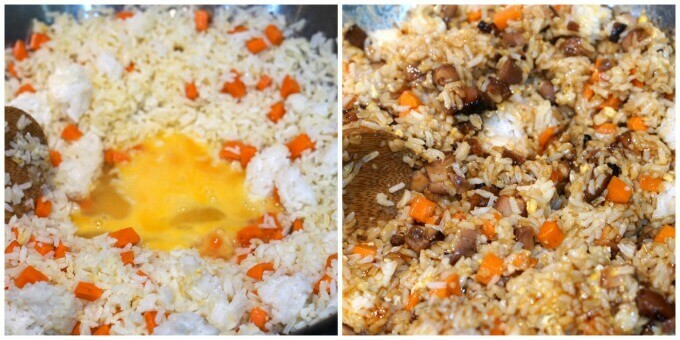 You’ll make a well in the middle of the rice and add in your beaten eggs. Then when the eggs are softly scrambled add the chicken meat, soy sauce and sesame oil. Mix everything together well. Add in the frozen peas at the end – they just need to warm thru and dinner is served! Pile the rice high, there will be plenty for everyone! Today I’m using leftover chicken, but you can just as easily use Tofu, Pork or Shrimp or all of the above! Mix it up and make your favorite. That’s what makes things extra delicious! Grab your chopsticks and dig in! Pork tenderloin would be delicious served with this rice or if you’re looking to keep it even easier, top the rice off with a fried scrambled egg. Delish! You ready to get cooking? Let me show you how easy this is! Click here for FREE Cheatsheet! 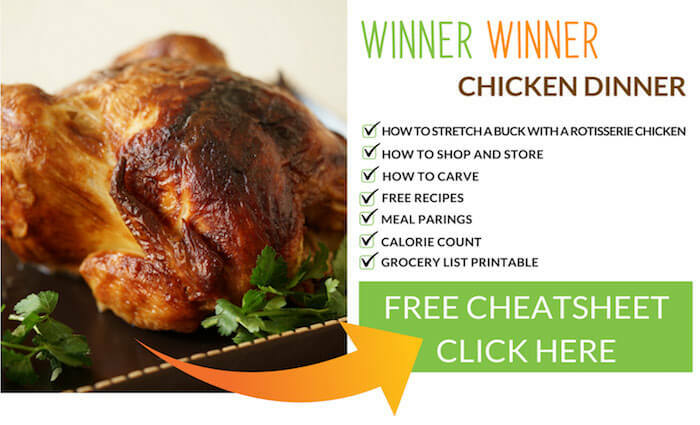 Everything you want to know to purchase, store and carve a rotisserie chicken! 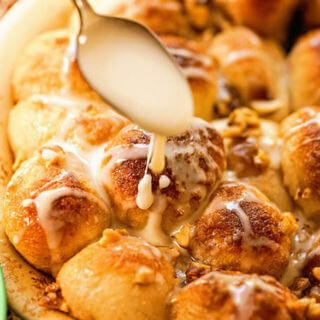 Includes recipes, meal pairings and a printable grocery list! More great takeout recipe? Gotcha covered! 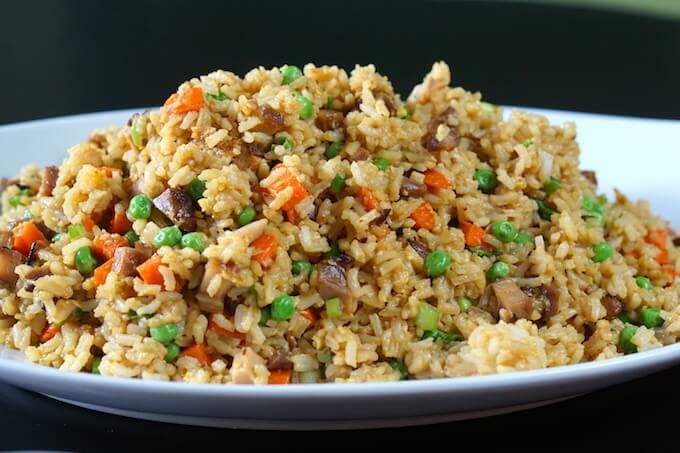 Chicken Fried Rice is easy to make at home and 100 times better than take out! Why not make it yourself? You'll enjoy it that much more!! 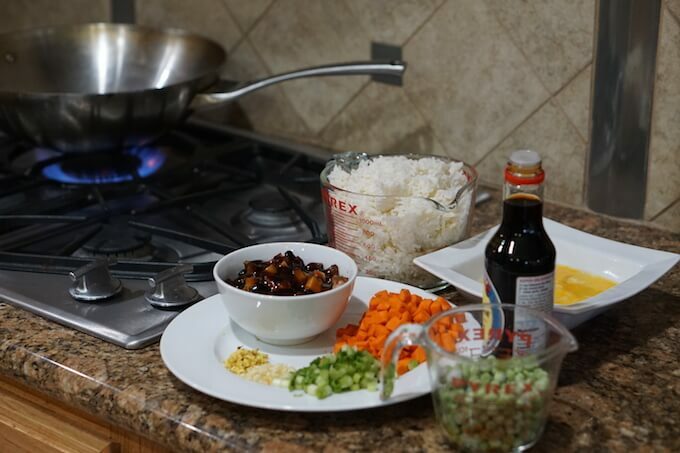 The key to cooking fried rice (or any food that's cooked quickly over high heat) is to have all of the ingredients already prepped before you begin cooking. Start by shredding the chicken. Remove it from the bone and shred it finely. Put it in a bowl and pour the teriyaki sauce over it. Return it to the refrigerator and allow it to marinate. Peel the carrots and dice them, about the same size as the frozen peas. Mince the garlic finely. Using a wok over high heat start by sautéing the carrots using the canola oil. It won't take long - 2-3 minutes. Keep stirring continuously as your wok will be very hot. Add in the minced garlic and ginger and continue to sauté - do not stop stirring. Add in the rice almost immediately after adding the garlic and stir fry, mixing well. Make a "well" in the middle of the rice and pour the beaten eggs into the middle - keep moving them around as with the high heat it won't take long. Pour the soy sauce and sesame oil around the rice. When the eggs are nearly soft scrambled, add the frozen peas (they will heat thru and be perfect) and mix everything together. Add the chicken mixed with the teriyaki sauce. Mix everything together really well and you're done! 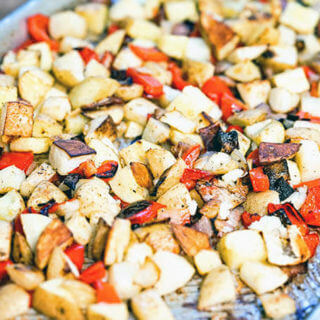 This dish is best served immediately, however when you're stir frying it's hard to get everything done at the same time. After completing this dish I've put it in an oven proof dish, covered with foil and tucked in the oven to keep it warm. This gave me time to make a second stir fry dish. **Day old or leftover, cold rice is preferred - the rice gets dried out. It doesn't stick together and works best for fried rice. Why go out when you can make your favorite Chicken Fried Rice at home? Easy and soo much better than take out! 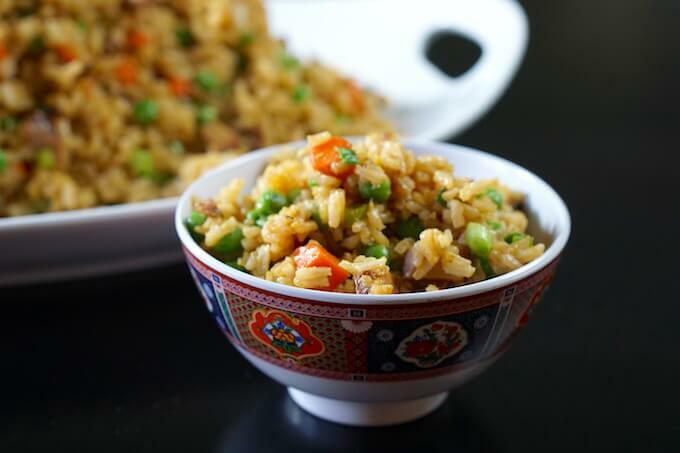 Fried rice is always a great classic family favorite! i love it especially with brown rice!! Pinning! Ilka that’s a great idea, I love brown rice!! Thanks for linking up at Let’s Get Real Weekly Link Party. 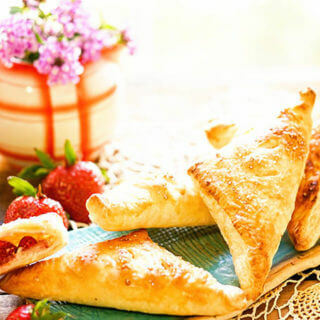 This recipe looks so tasty and I am featuring it tonight at the party! That’s awesome, thank you so much Patty! I always love your party and REALLY appreciate the feature. Thank you!! I love chicken fried rice. It’s alway a special treat. Easy to make at home also, thank you and I’m glad you enjoyed this meal! I aways have leftovers! My kids always leave something behind! And what a great idea for the use of these leftovers! Wonderful! 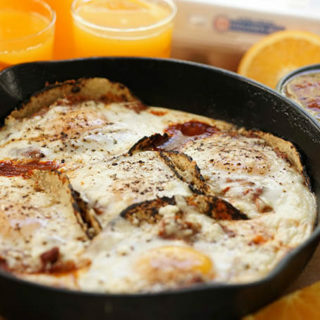 It’s always good to remake an old recipe – i hope you give this a try!